Bairrada is a Portuguese wine region located in Beira Litoral, stretching fom Águeda and Coimbra to the dunes of the Atlantic coast. The region is classified DOC, Denomination of Controlled Origin and is distinguished by dense color tannins and high tannins , of the local variety Baga, although it is also notable for the white wines and sparkling quality, result of the diversity of soils. It has a mild climate, tempered by the proximity of the Atlantic Ocean. 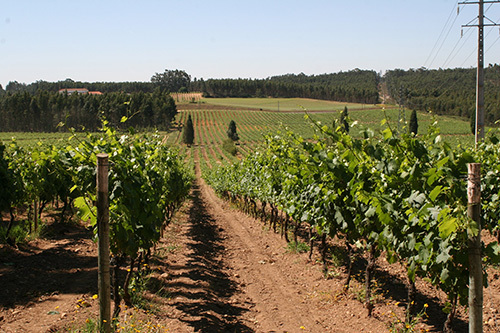 In this region of flat lands two types of soils that originate diversified wines are distinguished: the clayey or muddy ones, that gave rise to the name Bairrada, and the sandy soils. Although wine production existed since the 10th century, it was in the 19th century that it became a region producing quality red, white and sparkling wines, with travelers stopping in this region to eat the famous Bairrada piglet and drink their famous wines.